The other night, we were in a gap where regular season hockey had ended and play-offs had not yet begun. So, Matt fired up A Clockwork Orange. If you have never seen it, I recommend it - with a caveat. It's incredibly violent and misogynistic. It's kind of filthy, actually - and the violence is so crazy over the top that sometimes, you laugh at just how sick and frantic it is. And if you're uncomfortable with any of that - probably don't need to watch it. Honestly, it takes a fair amount to offend me. 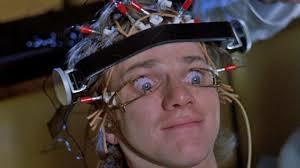 I thought A Clockwork Orange was worth seeing, and even re-viewing the other night. Is it one of my favorite movies? No. But it is endlessly quotable. My favorite Kubrick film is Dr. Strangelove. It's just so damn odd. One of my ex-boyfriends loved it, and he'd fire it up on Friday night after I arrived for the weekend. Only, I'd been up since 6AM, worked a full day, fought traffic all the way to Athens (1.5 hours away), then went with him for a huge meal - he worked at the library and didn't have a car, or much money. So we'd go to Ryan's and gorge. So, anyway - by the time he fired up the movie, I was zonked. I fell asleep on it a number of times. It wasn't until Matt and I were dating when I finally stayed awake through a whole viewing. It's a great damn movie. I am known for falling asleep in movies. I went with Matt and two friends to see the Seventh Seal at the Belcourt (the local arthouse cinema). It was warm and dark and I was sleepy. The movie was quiet (no big chase scenes), and since it's black and white, it wasn't super bright. I nodded off and I'll be honest, I don't remember a damn thing about it. We went to get coffee after and they all began to pick apart the movie. I had to sheepishly admit I had seen roughly the first 15 minutes. I fell asleep during a home showing of one of Matt's favorites - The Third Man. What I saw and remember, I liked. But I fell asleep during the climactic ferris wheel scene, which Matt brings up to this day. I'll try it again sometime. One that did offend me was Eraserhead. It was just gross, and disjointed and I was just disgusted by it. I walked out of the room. A few years later, I watched it again to completion. I still think it's sick. We watched The Bicycle Thief together and I was feeling a lot of personal anxiety at the time. The movie made me feel incredibly agitated, and I was furious with Matt about how it ended. Which is ridiculous. Mostly, though - Matt has steered me right. We both love The Big Lebowski. Went to a midnight showing at Belcourt - he was dressed as The Dude. I was Walter Sobchak. My father loved Lebowski, too - hence their pug named The Dude. We saw a screening of Blade Runner at the Belcourt and I became obsessed with it. I had never seen it, though most of the guys I had dated loved it. I finally got why. It's one that is so rich and lovely and ugly and funny and sad and exciting. I love it. One year for Christmas, I asked Matt for an umbrella with a light up handle, like the ones in the movie. Going back to Kubrick (and the Belcourt) - we saw Barry Lyndon on the big screen and it is just lovely. I had never seen Goodfellas or The Godfather until we were married. The latter was another Belcourt viewing. It was so beautiful and textured and complex. I fell in love. We watched the sequel at home. Part 3, I've never seen. And that's fine, as it happens. We saw an older film, one that my parents loved when it was released called Walkabout. It is mostly visual - sparse dialogue, and it's remarkable. I didn't know til after we saw it that my parents had loved it too. Oh, let's see... Some Like it Hot - I gave Matt a copy for Valentine's Day one year - and it just makes me laugh. Honestly, though - Jack Lemmon - love him in anything he did. Matthau, too. I saw Shawshank Redemption right out of college and it resonated with me because of the character Brooks, who killed himself after getting out of jail because life was too scary on the outside. I had just been "deinstitutionalized" after sixteen years of being a student, and I was having a hard time of it. To be clear, I never thought of hanging myself after carving my headstone in the ceiling beam. Another one with Tim Robbins that I love is Hudsucker Proxy. Quotable. Visually interesting and just neat. I love it. And finally - because it is the Friday before Easter. Matt used to make a habit of watching The Long Good Friday every year (on Good Friday). Bob Hoskins, an extremely young Helen Mirren. It's definitely dated, but damn, it's a good story. So, all of that said, we'll be in Hockey Playoffs for awhile, and so I'll be ready for something new by mid May. I'll get the popcorn ready. No love for 2001? Okay, I know--slow, very little plot, and difficult to unpack. In my youth I went through a phase of being fascinated by everything Kubrick. Anyway as much as I love the Belcourt I think The Big Lebowski is almost better on network TV--the censored version, with Walter screaming, "THIS IS WHAT HAPPENS WHEN YOU FIND A STRANGER IN THE ALPS, LARRY!" Also if you're ever inclined to go to M.L. Rose for hot wings and beer go to the last booth on the far left side. That's where the wall is decorated with Big Lebowski cartoons.